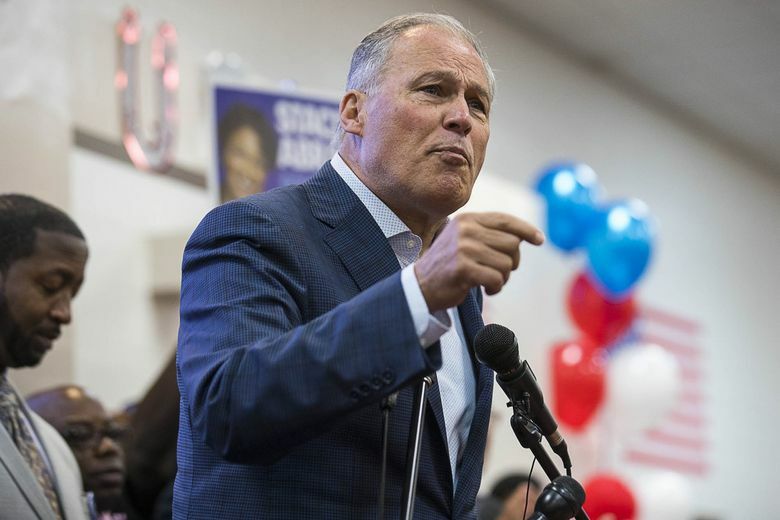 In an interview about the midterms and his future, the Washington state governor emphasized the significance of Democratic wins in the governors races, and his determination to pursue climate legislation despite Initiative 1631's defeat. He said he'll decide on whether to pursue a 2020 presidential run in the coming months. As chair of the Democratic Governors Association (DGA), Gov. Jay Inslee spent much of the past year crisscrossing the country, working to reverse his party’s historic deficit in governors mansions across the country. On election night, watching results from Washington, D.C., Inslee had some cause to celebrate. Democrats wrested seven seats from Republicans while losing none — the largest net gain for the party in 36 years, and included victories in some key swing states. Back home, results for Inslee were more mixed. Democrats added to their majorities in the state Legislature. But Initiative 1631, a carbon-fee measure Inslee championed on his signature political issue of fighting climate change, was rejected soundly, losing by more than 315,000 votes and in 36 of 39 counties. All of that leaves Inslee, 67, midway through his second term, facing an inflection point in his political career. With a national profile boosted by his DGA role and his forceful denunciations of President Donald Trump, Inslee has not closed the door on joining the queue of Democrats, including better-known figures, preparing to run for president in 2020. But he also has said he could seek a third term as governor. In an interview last week about the midterms and his future, Inslee emphasized the significance of Democratic wins in the governors races, and his determination to pursue climate legislation despite I-1631’s defeat. He said he’ll decide on whether to pursue a 2020 presidential run in the coming months. While he has not started hiring staff for a presidential run or exploratory bid, Inslee said, “We have talked to some people in general” about potential roles in a national race, pointing to aides who work for his gubernatorial campaign. Inslee has cause to boast about Democrats’ pickups in governors races, which included such marquee victories as Tony Evers’ defeat of two-term Gov. Scott Walker in Wisconsin, and Laura Kelly’s win over Kris Kobach in deep-red Kansas. Overall, Democrats now control 23 governors seats compared with 25 for Republicans. In addition to Wisconsin and Kansas, Democrats flipped GOP seats in Nevada, Illinois, Maine, Michigan and New Mexico. Inslee said the DGA boosted its fundraising by about 50 percent on his watch, allowing it to compete in more states. 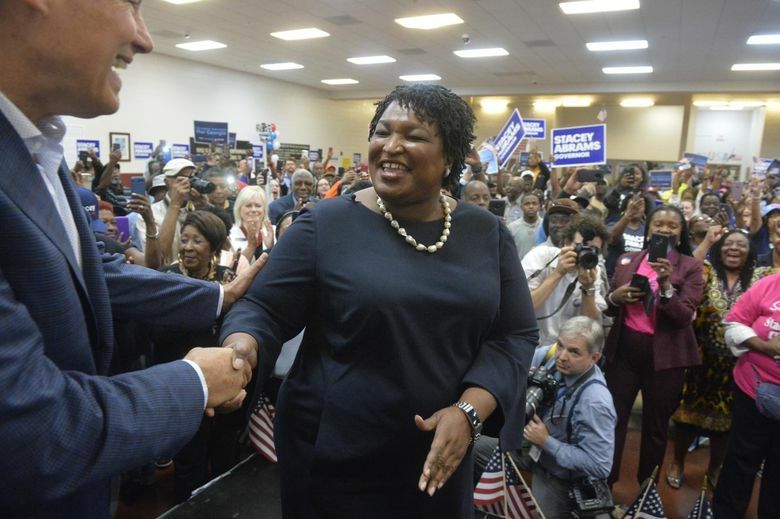 Two races remain contested, with a recount ordered in Florida between Republican Ron DeSantis and Democrat Andrew Gillum, and a possible runoff in Georgia between Democrat Stacey Abrams and Republican Brian Kemp. Inslee campaigned in both states just ahead of Election Day and said he’s focused on making sure all the votes get counted. However those races turn out, Inslee said Democratic gains mean a majority of Americans will live in states where a Democrat is governor next year. He pointed in particular to Midwest states formerly known as a “blue wall” for Democrats, but which Hillary Clinton lost to Trump in 2016. Inslee said the successful Democratic candidates emphasized local issues such as funding public schools and fixing roads. “We showed that Democrats can connect with working people in the Midwest. We showed they will vote for Democrats when they are shown that vision statement,” he said. Democratic governors are crucial in part to stop gerrymandering of legislative and congressional districts, Inslee said, giving the party a better shot in coming elections. The DGA won seven of 10 states it had targeted as part of its “Unrig the Map” effort. The Republican Governors Association (RGA) downplayed Democrats’ successes, pointing to seats the GOP held, as well as the pickup of Alaska, where an independent had been governor. “Even though we were defending 26 of the 36 governorships up for grabs — the highest number of governorships our party has ever had to defend in a single election year — Republicans held the line and fought back against the ‘blue wave’ that the Democrats assured was coming,” RGA spokesman Jon Thompson said in a statement. Election night carried big disappointment for Inslee and his environmentalist allies with the defeat of I-1631. Despite being dubbed “the nation’s greenest governor” by some environmental groups upon his election in 2012 — and making fighting climate change a top issue — Inslee has repeatedly failed in efforts to enact a price on carbon pollution. Efforts in the Legislature have fizzled, and Inslee and environmentalists opposed a failed carbon-tax initiative two years ago that took a “revenue neutral” approach, proposing to cut other taxes as it raised carbon taxes on fossil fuels. I-1631, by contrast, sought to raise $1 billion by 2023 to be spent on clean-energy projects and helping the state prepare for rising sea levels, more intense wildfires and other impacts of climate change. Inslee blamed the I-1631 loss on “the oil industry’s obfuscation of a complicated issue,” pointing to the record $31 million raised by opponents, which fueled nonstop TV ads criticizing the initiative as jacking up fuel and utility costs. Supporters of the measure raised $16 million. Specifics of that legislation are being developed and could emerge in the governor’s budget proposal, to be unveiled in December. Republicans slammed the continued climate effort. Inslee’s DGA schedule in 2018 has taken him on multiple cross-country trips, including to key early primary and caucus states for the presidential election, such as Iowa and New Hampshire. His campaign emails also have increasingly focused on Trump and national politics. On Thursday, Inslee spoke at a Seattle rally — one of hundreds of similar gatherings across the nation — where more than 1,000 people gathered to demand Congress protect the investigation of special counsel Robert Mueller into Russian interference in the 2016 election. Inslee says his efforts to elect governors, and his speeches about Trump, are not about 2020, but have been motivated by more immediate dangers to the country.